I'm so glad to see you and be able to share this wonderful new release with you all !!!!!! 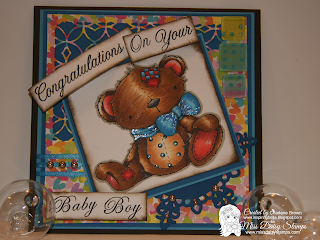 Join our celebration with a Blog Hop as we welcome Jenn Nilsson to Miss Daisy Stamps! The PRIZE is a FREE image of your choice from Jenn Nilsson Art sold at Miss Daisy Stamps! COMMENT on this post to show us that you were here, then hop along to YOUR NEXT HOP as mentioned at the bottom of this post. Contest closes Thursday, September 8 at 9:00 am EST. If you have followed the hop in its entirety you will qualify for a FREE image of your choice from Jenn Nilsson Art at Miss Daisy Stamps! I love this cute little guy, a very versatile image. You could use it a a birthday card or a baby card boy or girl. A young couple that I know just had their first baby and he was born about a week ago so I thought this image would work perfectly. I colored him using copic markers and found a bright fun colorful paper line in my stash . I love how this turned out so I'm so please to share this card with you all. Thank you so much for stopping by on this blog hop. Charlene, your card is so sweet!! The bear looks perfect and furry..i want to hug him!! Awesome coloring. The texture is great. Love the card. Lovely card and I love your coloring of the bear. Great card Charlene with lovely colouring of the cute bear...he looks so real! 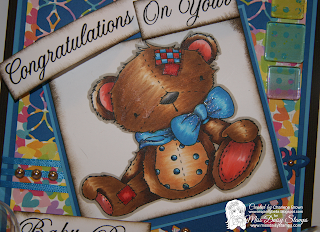 Beautiful card, love how you colored the bear! Sweet, cute image, and the card is charming. Spectacular layout, colors and wonderful highlighting of this cute image. Loving the cursive of the sentiment too. Such a sweet image! Your colouring looks amazing! A very adorable card! Fantastic fur colouring on your cute Teddy Charlene..gorgeous card. Wow, this is such a cute card and wonderful image. Love it! Gorgeous card and your coloring Charlene is beautiful! Love your card and this great image. Teddy Bears are my fave.